Brief walk through the Wall Street area including the Bowling Green Bull. 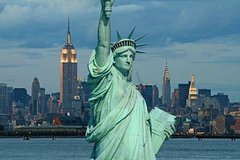 We will visit the Statue of Liberty where our guests will have access to the Pedestal (museum). This does not include access to Ellis Island. We will visit the north and south pools at the 9/11 Memorial. Note: This does NOT include entrance to the 9/11 Museum.